With the commercial rollout of the 5G wireless network looming next week, major mobile carrier KT pledged Tuesday to offer the most extensive coverage in South Korea amid growing rivalry over the quality of the advanced wireless network services. 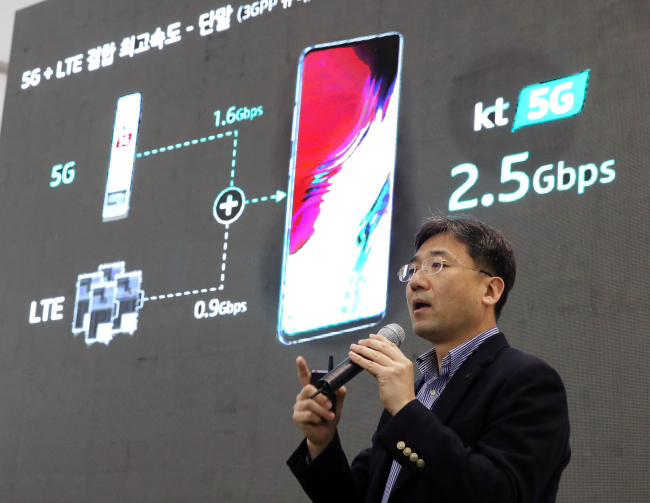 During a press conference in Seoul, KT said it will establish up to 30,000 5G base stations when the country’s first 5G smartphone hits the market. Samsung Electronics said last week the Galaxy S10 5G will become available on April 5. KT also said the company will expand the 5G network dramatically with a plan to provide full-fledged nationwide services by the end of this year. About 80 percent of the country will be covered by its 5G wireless network, the company said. “By the end of this year, we will establish a network capable of covering 85 cities in Korea,” said Seo Chang-seok, who serves as an executive vice president at KT Network Strategy Unit and Network Group. The telecom company also asserted that it is able to deliver faster speeds for 5G network service than its rivals, with competition growing over which mobile carriers can create an ideal environment for hyper-speed, low-latency 5G network services. During the speed test in downtown Seoul, KT showcased its commercial 5G network’s maximum speed of 1 gigabyte per second using Galaxy S10 5G. The company said the smartphone was connected to Samsung’s base station with 3.5Ghz frequency. While the speed falls short of SK Telecom’s 2.65 gigabyte per second, KT said its network can provide faster standalone 5G services. SKT achieved the record by combining 5G network with its 4G LTE network. KT’s announcement came amid growing competition among mobile carriers here over who can provide faster 5G network services in wider areas -- a scene that is repeated every time the country gears up for a new wireless network. While KT asserted that it can provide faster 5G network speeds with more extensive coverage, its competitors countered that the results would vary depend on the standards for assessing the network quality. Industry waters said while KT could have more base stations than its competitors when the country begins commercial 5G services, the gap is not too big for its rivals to catch up. According to KT, about 15,000 base stations have been already established in Seoul. Most of them were put up in populated areas such as shopping malls. The network has also been established in transport infrastructure, including airports and train stations. As for KT’s competitors, SK Telecom has not reveal the exact number of 5G base stations. LG Uplus has said it has similarly set up about 18,000 stations in Seoul and the surrounding metropolitan area. Industry watchers said it is because most of KT’s base stations are built with equipment from Samsung. The company has been pulling its weight to catch up with global competitors such as Huawei, Nokia and Ericsson, who provide 5G equipment for SK Telecom and LG Uplus.